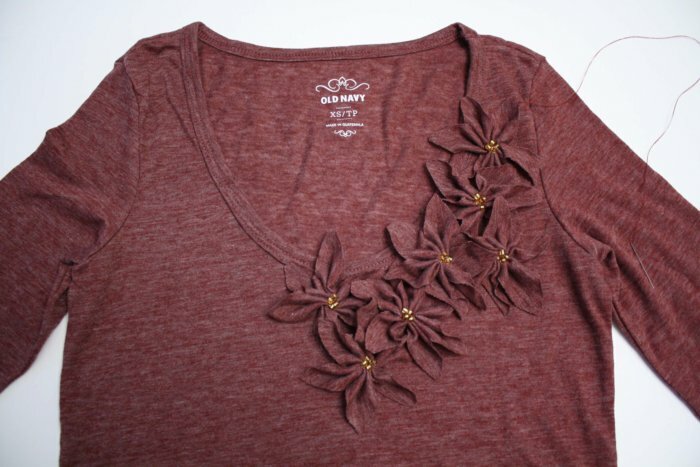 This pretty embellished t-shirt cost me less than $5 to make and the poinsettias are subtle enough to wear it well beyond the holiday season. 2 t-shirts. I got mine on sale for $2 each. 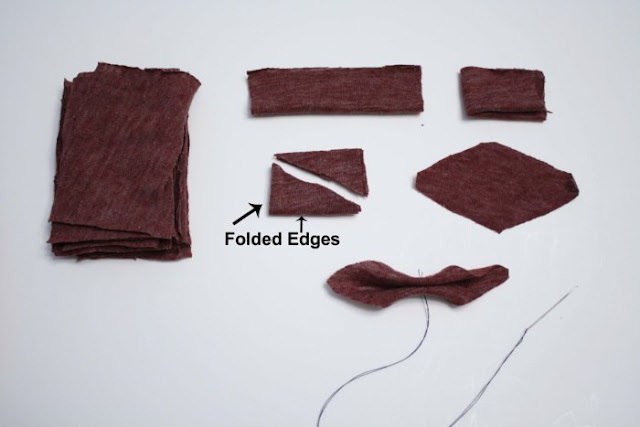 One needs to be the final size for your recipient, and you should buy the other in the largest size they have to have extra fabric to cut up. Scoop or v necklines work best. 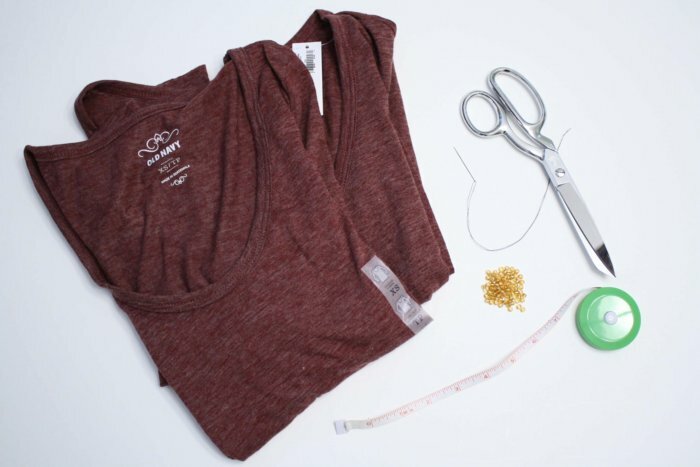 You won’t use the entire second shirt, so if you want to make more than one, figure on using 1 1/2 shirts per finished shirt. 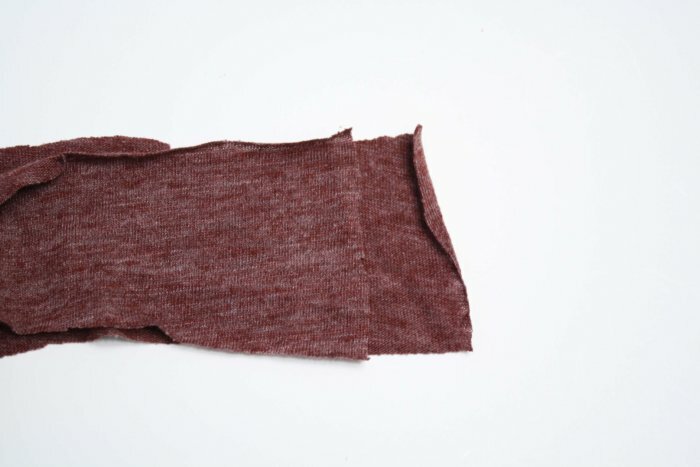 Cut the hem off your second shirt, then cut the shirt into 2 inch wide strips. 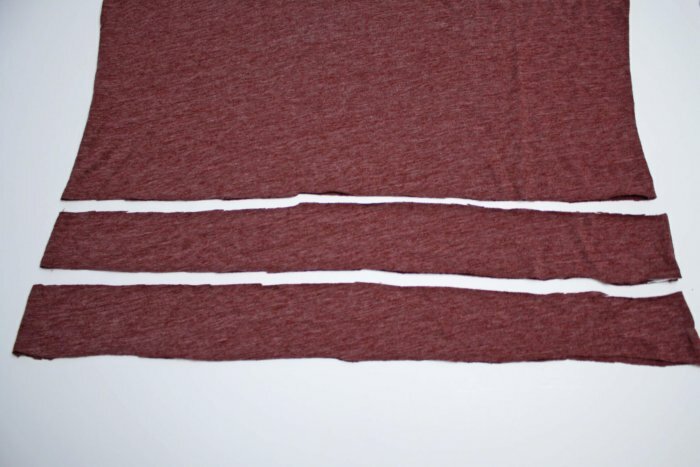 For each shirt you’re making, you’ll need at least 2 of these strips. 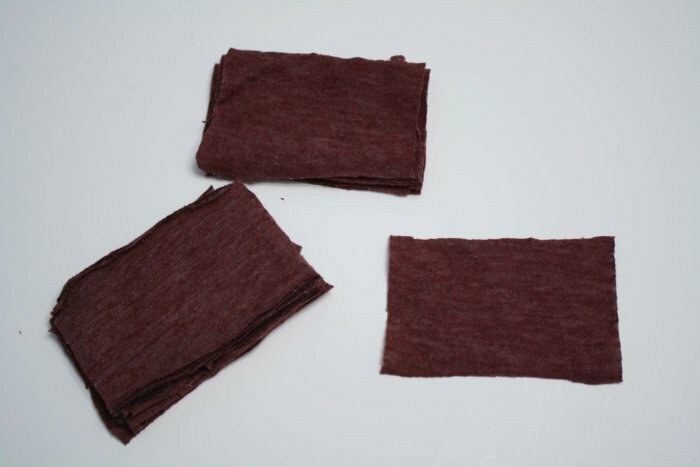 Cut one end of the 2 inch wide strips open, then cut as many 3 1/2 inch long pieces of this strip as you can. You’ll need 21 of these 2 in x 3 1/2 in rectangles. 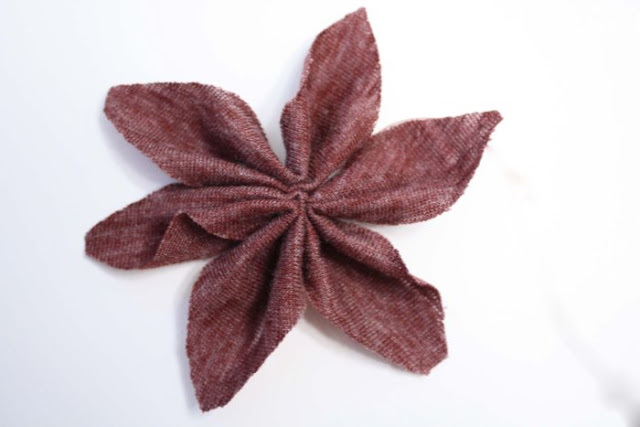 Pinch petals in half as pictured, and sew 3 together in the center to form the flowers. 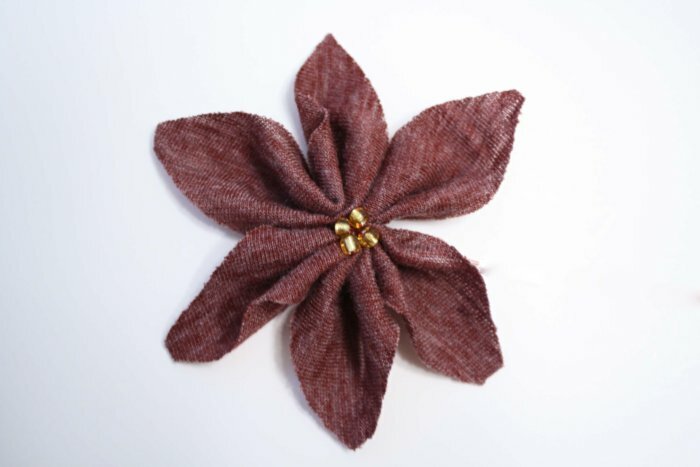 Sew 4 beads into the center of each flower. 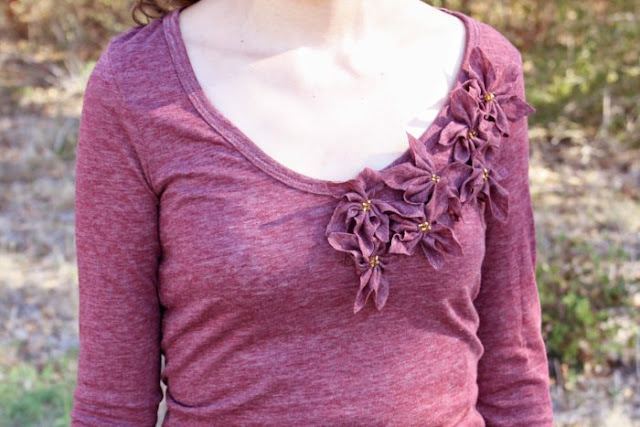 Arrange the flowers on the neckline of the shirt, then sew into place from the inside of the shirt. 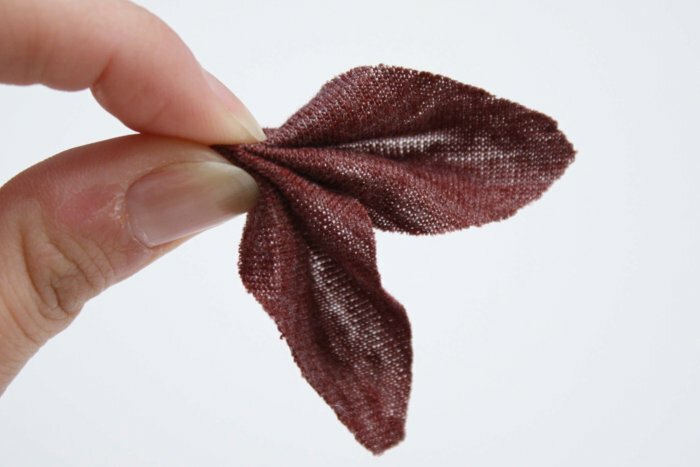 You want to sew the centers, and probably a few of the petal edges. And then wrap it up! How Darling! I have a bunch of t-shirts that need a makeover. These flowers are so unique. Can’t wait to give it a try! Those are awesome! What a great embellishment! Hi! I saw your shirt on CRAFT–great job! I really admire people who can do great refashions! I love this! I hope you’ll stop by my fairly new party. The party is open until Friday here, http://www.coffeeandtheirkisses.com/2011/11/stitch-n-niche-saturday-6.html. Awesome work you did with less fabric, I have to try once for my plain t-shirts, I have lots of plain t-shirts, It will be best to attach flowers in contrast color. 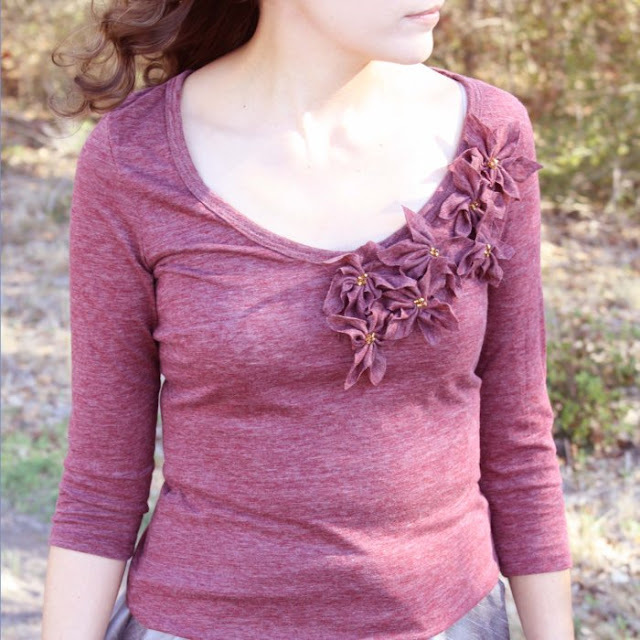 This is a beautiful shirt refashion! So simple and elegant! This is amazing!! Great idea and tutorial! this is so pretty! i really have been meaning to do a shirt redo like this for a long time now! Pretty! I’m going to try this for Christmas. I love your top! Nice flowers and different from the usual. I have a little sewing and fabric craft linky party I’m starting tomorrow and I was wondering if you could be so kind to stop by and post it? Thanks so much! Great tutorial! We featured it on our Facebook page today! Very very cute I love it!! Please do come and join my Valentine Giveaway!